After our quick stop into port, we were back to the sorting last night. I will take you though a step-by-step account of the sort. A science crew member reports to the Bridge for the 30 min Marine Mammal Watch. The fishermen ready the net. We arrive at the Station. Science crew goes on deck for the Outdoor Marine Mammal Watch. The fishermen put the net in the ocean and begin trawling. After a 15 minute trawl, the net is hauled in and the Marine Mammal Watch ends. The crew brings the sample collected in a bucket into the Science Lab. Based on the size of the catch and the organisms present, the crew determines an appropriate sample size. This time we went with a 250 ml sample as there were a TON of small pyrosomes. We sort based on visual identification. 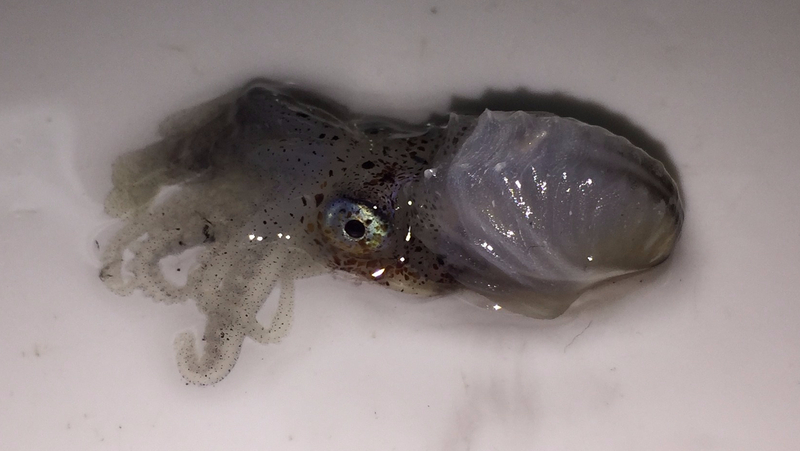 We found pyrosomes, some anchovy & market squid, as well as flat fish and salps. People sorting will call out their counts of each species and record the numbers collected. Isolate a sample of krill to be specifically analyzed. They determine the species in the sample and number of each. Determine a second sample size to analyze. At each subsequent sample, we will stop counting specific organisms, such as tonight when we stopped counting the pyrosomes because we had enough data to extrapolate a value for the number collected. Then we stopped counting anchovies, etc. until we are just looking for outliers, or creatures in such low abundance an estimate would not be acceptable. Repeat the steps until we have gone through the entire catch. Afterwards, information is logged into the database and representative samples are measured and recorded. The last step is to prepare samples for onshore analysis. Many labs have a standing request if samples are available, such as 5 Hake or a sample of anchovies. 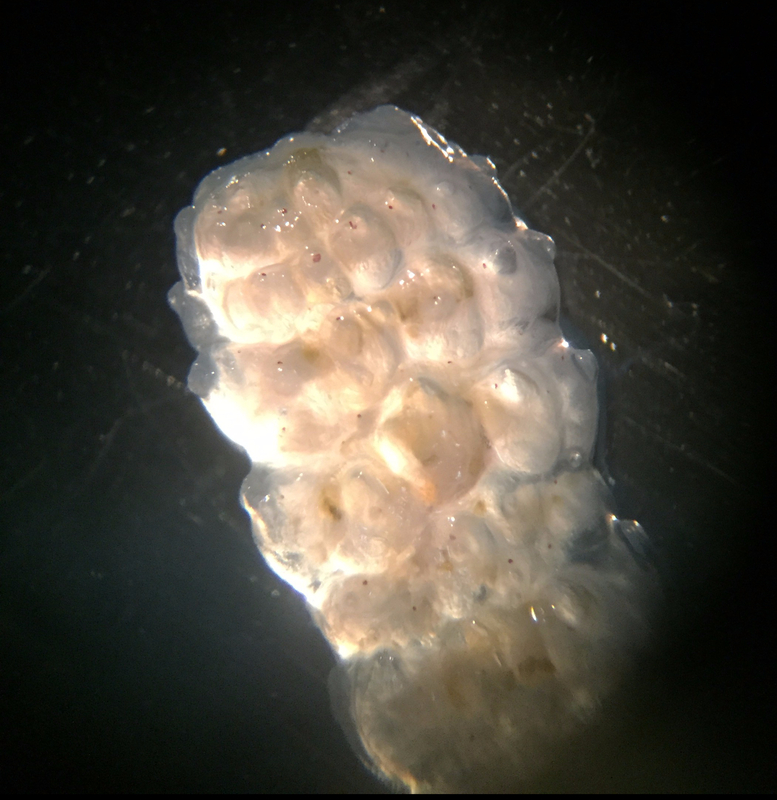 Specifically, the juvenile rockfish will undergo DNA analysis as well as having otoliths removed for further analysis. Basically, fish grow these little ear bones with rings like a tree. The more rings, the longer a fish has been alive. Therefore, the researchers can determine the age and growth rates of the fish based on these features. A Pyrosome under the microscope. This is really a COLONIAL organism, not truly multicellular. We arrived in port today, so nothing on the science end to report. As we conducted the trawls the night before, I was still on the night schedule and missed out on a chance to explore San Diego. However, we did go to dinner with the other science personnel that work the daytime shifts, which was nice. The repairs went well and we returned to the ocean. We arrived at a station just after midnight and worked on 3 trawls. Waves started picking up during the shift. It is supposed to be windy again, which means the waves action will increase too. Did I mention the winds were going to pick up? Wow. They were right – and tomorrow won’t be any better. I put the patch back on, which is unfortunate because my major side effect is that it really makes me tired. Or it could be that I have a tendency to visit the Flying Bridge to watch the sun come up. Tonight we caught adult anchovies – and a lot of them. We ended saving a lot of the catch for other labs and for bait. 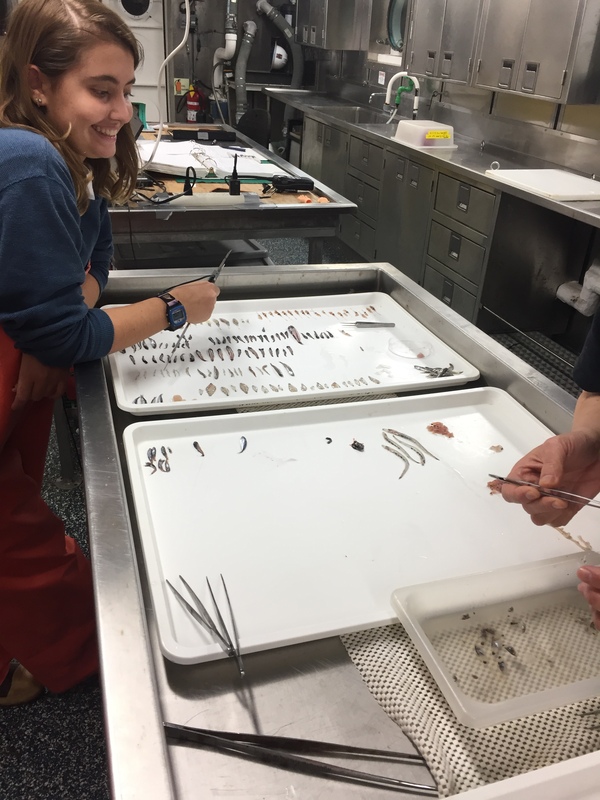 Starting the sort – check out those adult anchovies! 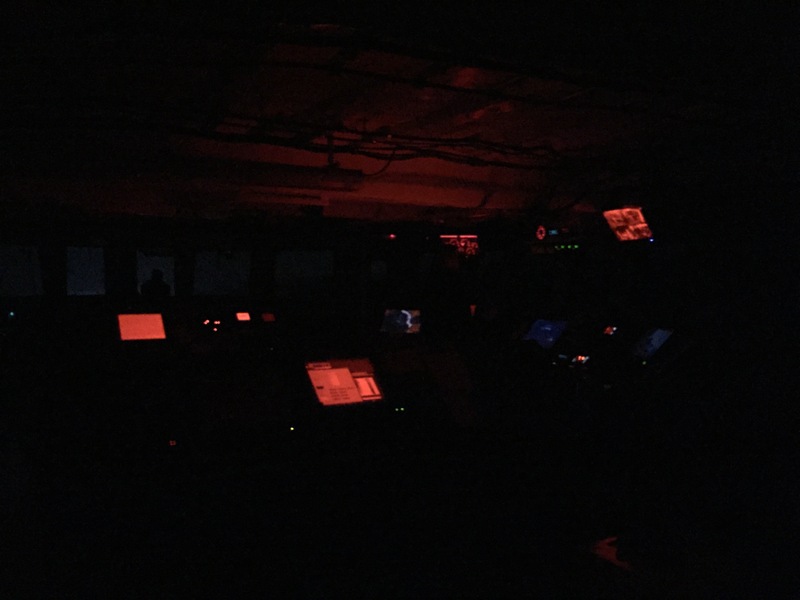 At night, the officers piloting the ship keep all the lights off on the bridge. All displays are illuminated with red lights. In this way, the people on the bridge will keep their eyes adjusted to the dark and they will be better prepared to spot potential problems on the water. At night, bridge displays are illuminated with only red light, which keeps officers’ eyes better adjusted to the dark. 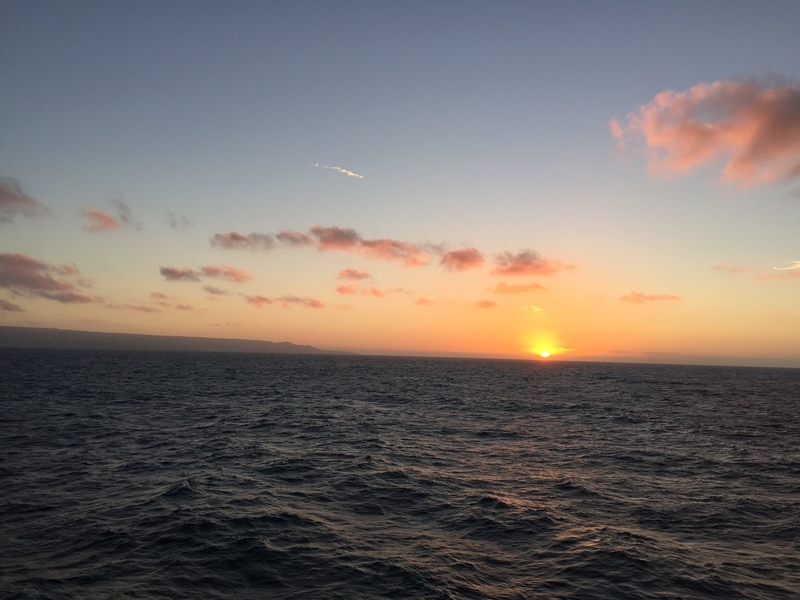 This entry was posted in 2017, David Amidon, NOAA Teacher at Sea and tagged anchovy, argonaut, catch, juvenile rockfish, NOAA Ship Reuben Lasker, pyrosome, San Diego, trawling. Bookmark the permalink.